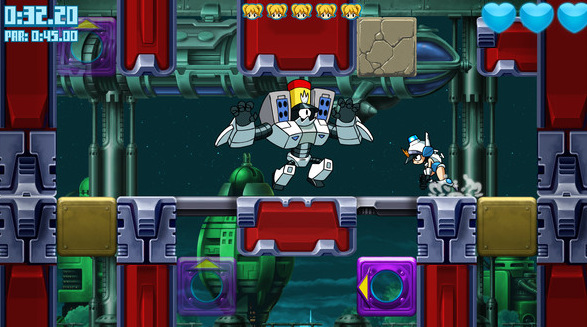 Mighty Switch Force: Hyper Drive Edition (a very clever pun on HD edition) is an action platforming puzzle game (that's some combination) that has you playing as a hot, hotshot police officer named Patrica Wagon. Patricia Wagon is on the job to go out and capture a bunch of hot criminals named the Hooligan Sisters as they have escaped from a police van that was taking them to prison. To arrest these criminals, Patricia Wagon must travel across levels that are full of block puzzles and these puzzles will require you to use your brain to figure out how to get to the criminals, all while trying to beat the levels in a fast time. 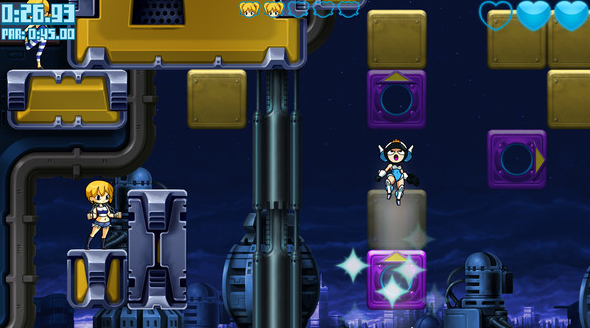 Hot girls, hot action, hot puzzles, all in one hot platformer? This game must be too good to be true... Right? (Click on "Read More" to read the full review). The story in this game is incredibly basic and only serves a purpose of getting you curious about this game and it did work but do not expect any deep story progression, you only get the story at the start and in the ending. If you were to play this one for the story then you'd be confused due to the nonsense of the Hooligan Sisters breaking out of jail, just to be waiting in places to be picked up to be put back in jail... Yeah, the little story we do have doesn't make any sense. What you will be playing this game for is the gameplay and the cast of characters. 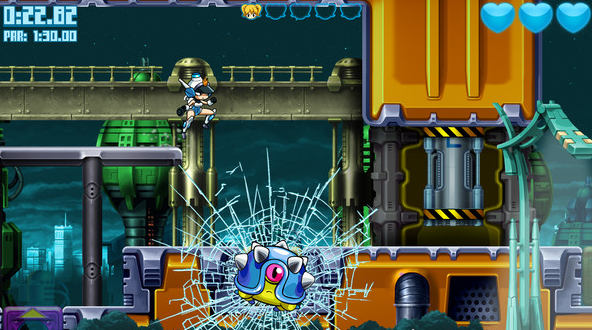 The gameplay style takes the frantic platforming style from games like Megaman (1987) and Strider (1989) and gives it its own unique flavor by mixing in an element from puzzle games. Combing all these styles of gameplay made for a very fresh experience and also a very classic one as the gameplay is so strong, you'll be remembering this one for a long, long, long time. The goal of the game is to capture five Hooligan Sisters that are scattered throughout the levels, then get to the police robot so he can take you back to the station, all with trying to get a good/fast time. The timer doesn't have a limit per se but you will be rewarded for beating the stages under a par time and it is very satisfying to do so. You can fail a level in this game, you do so when you have lost all of your health, once you have lost, you'll have to start the level all over again. What causes you to lose health are the enemies and spikes, so be careful how you navigate around them. 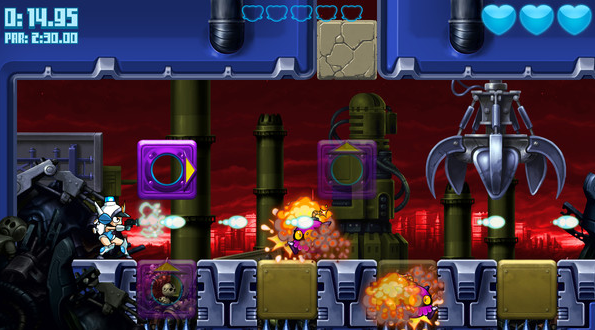 Most enemies are easy to kill but there are some enemies that'll require some strategy in order to take them down. Enemies aren't just in the game to be destroyed, they are also the solution to solve some of the puzzles and that's a nice touch as it makes them useful and not just put into the game to be a random distraction. Destroying certain enemies will also cause them to drop floppy discs (remember those, kiddies?) and these discs will give you back one hit point, so make sure to grab them when you need them. 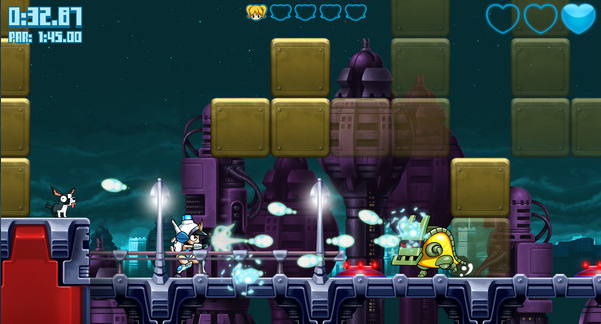 Controls in this game are very simple as you have a jump button, an attack button, and a button to switch the blocks. While simple, mastering the art of combining your moves will be hard as you'll need to use a bunch of commands quite quickly and quite frequently towards the end of the game and it can lead to frustration. This hectic nature will pressure you into pressing the wrong button and that alone is enough to make you rage, so I recommend playing this one with a controller plugged in instead of playing on keyboard. There is an unlockable weapon that you can use in the levels that you have beaten and this weapon will fire though anything and kill any enemy in one hit and this will make firing less of a hassle, so you can put more thought into working on your jumping and block switching. The characters in this game don't do much but despite that, they are full of charm and personality as their simple actions really tell you a lot about the characters and you'll fall in love with them instantly. Most of the characters in this game look like incredibly beautiful pin-up models mixed in with a crazy Saturday morning cartoon style. This game managed to pull of the pin-up model look without making the female characters look trashy or disrespectable as their look doesn't take away any of the power that they all have... But that doesn't mean that the women shouldn't be wary of their men trying to find a way of trying to have an affair with Partrica Wagon as they'll see her as their waifu (can't believe I used the millennial term, "Waifu" in my review, so embarrassing). I also really liked Patricia's pals which include a little dog and a giant robot that also acts like a police car as they helped add variety to the character designs and also added to the crazy Saturday morning cartoon vibe. The length of the game is decent, there's quite a few levels that all range in difficulty and they are all full of replay value, so you'll be playing and replaying this baby for a long time to come. You'll also be spending hours on trying to fine tune your craft to get really good times and it is worth it as it is fun trying to master this game and once you have mastered this game, it is still fun to play. A rare complaint I have with this game is with the final boss (yes, this game has one believe it or not) as it is a bit out of place due to it being more of a straight up action platformer, instead of being a puzzle platformer with action elements. This boss level wasn't bad in a sense, I just would've like to have seen this level in a more traditional action platformer and yes I think having a game in this series that takes the traditional action platformer formula would be a great thing, do it, do it now (yes, I was saying that with an Arnie voice). Graphics in this game have a very clean 2D style that also has a neat 1980's science fiction look to them and it'll make you feel nostalgic for old Capcom games and cartoons. The coloring is full of a lot of blue, grey and it does look good and also helps to add onto the 1980's science fiction atmosphere. You will also see some other colors in there too and they really stand out due to the blue and grey. If you feel that the graphics are too clean, you can switch Patricia to a retro sprite that has a more pixelated look but I wasn't really a fan of the retro sprite, it clashed with the clean look of everything else and it didn't look good. The animation in this game is basic but effective and I really enjoyed it, especially the animations of Patricia blowing up stuff and being fired out of cannons, so the animations also add more fun into the game. There is one problem that happens with the character sprites and that is how they can sometimes flicker and that does get really annoying as you can not see where you are going. Oddly enough, while the sprites flicker, the backgrounds stay in tact, so it makes me feel like that I am playing a Sega 32X game while the 32X's cable is not in the socket properly (Sega 32X fans will get what I am on about). The sound effects are very cute and also go well with the neo-retro theme of the game but there was also not a lot of sound effects and there were times where this game needed some more, especially for when you've defeated an enemy. The sound effects also include voice clips for Patricia and it was a very nice touch that added more charm to the character. The soundtrack in this game is part electronic, part chiptune, and part rock and it was done really well, the songs were really well made and it just kills me that I can't find a way to buy the soundtrack to this one. Overall, this is a fun, charming, clever, well done puzzle platformer and is the best of its kind to date. I highly recommend playing this game due to the high fun factor but be warned, you'll defiantly wish that Patricia was your wife. Great, great game.